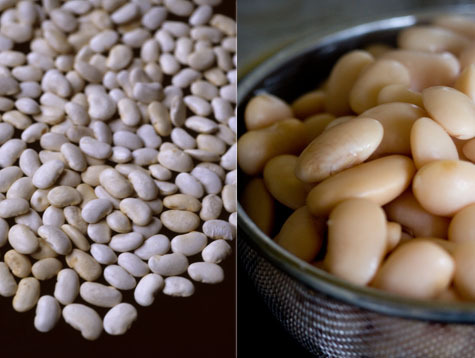 Food & Wine magazine's Emily Kaiser wrote an article in November that highlighted two of my favorite things: Steve Sando's Rancho Gordo heirloom beans, and a bean recipe from NOPA - a restaurant just a short walk from my front door. The article was published in November, and I've cooked Laurence Jossel's beans four times since then. I even brought them to meet my family on Thanksgiving. Imagine plump, creamy beans baked in a bright, chunky tomato sauce, topped with crunchy breadcrumbs, plenty of tangy crumbled feta, and an emerald drizzle of oregano-parsley pesto. I love his original recipe, but the last time through I decided to add a few of my own twists. I did a subtly smoky chipotle-version of the tomato sauce, a cilantro drizzle, kale, whole grain bread crumbs, and queso fresco cheese (recipe below). One of the great things about this recipe is that you can do many of the components ahead of time - you can boil the dried beans, make the pesto, make the tomato sauce, and toast the breadcrumbs. None of which are exceedingly difficult. You can then assemble the components in a flash, and into the oven it goes. Perfect for when you have friends over. I'm sure someone is going to ask, so I'll answer ahead of time - what about substituting canned beans? In my experience canned beans lack the structure that beans cooked from scratch have. The canned guys tend to break and go to mush more quickly. In this recipe they will likely work, but won't hold up as well. Give these beans a try (either version), they are outrageously good. Related links: Richie is a linecook at NOPA, NOPA food blog, NOPA wine blog. In the lead photo you can see that I used queso fresco cheese, it is creamy, and oozy melty - totally different results vs. feta, which stays relatively structured and is quite a bit more salty. You can use either or a combination of the two. Preheat the oven to 425F degrees. 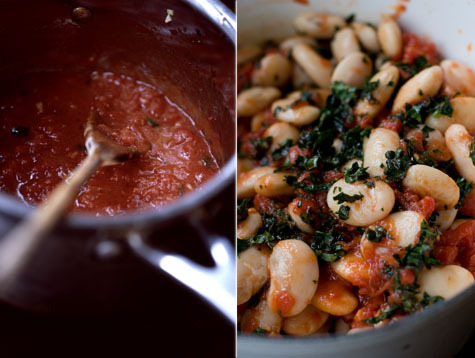 In a 9x13 baking pan (or large oven-proof casserole/dutch oven) toss the beans with the tomato sauce and the kale. Sprinkle with the cheese and bake in the top-third of the oven for roughly twenty-five (if you're using queso fresco) to forty minutes, I look for the cheese to start browning and any visible beans to get a bit crusty. Remove from oven and let sit for about ten minutes. Top the beans with the breadcrumbs and just before serving drizzle with the cilantro pesto.